Humans are the only species on earth that drinks milk after infancy, and we’re also the only one drinking milk from another species. Soy milk didn’t really catch on, except for hippies, until near the end of the 20th century. That’s when headlines began announcing its benefits for preventing heart disease and cancer. The anti-soy folks made much of the fact that 90% of the soy grown in the US is genetically engineered and sprayed with toxic herbicides. That is a problem, of course. But GMO soy is primarily fed to livestock, and soy milk that’s certified non-GMO or that’s certified organic doesn’t have this problem. The fear of soy, whether it was warranted or not, boosted the creation of other milk substitutes, which are now in nearly every grocery store and many coffee shops and restaurants. Plant-based cheeses, plant-based butter alternatives, and plant-based yogurt and probiotic drinks are now available as well. Non-dairy milk comes from plants, not animals. No sentient being is harmed to make them, and no babies are taken from their mothers and turned into veal, either. In contrast, industrialized dairy cows often lead miserable lives. Many never see a blade of grass. Most are impregnated yearly — and their babies are taken away until they’re around four years old, at which point they can no longer keep up with the demand and are killed to become hamburgers. The dairy industry has become an ecological disaster. Animal agriculture is responsible for 83% of total global agricultural land, yet produces only 18% of the world’s calories. It’s a leading driver behind the destruction of tropical rainforests. And cows are huge contributors to climate change. The methane they release is 23 times more powerful than carbon dioxide in warming the atmosphere. Dairy also uses a lot of water. Factoring in the amount needed to feed and raise cows, it takes 976 gallons of water to produce one gallon of milk. Advertising for dairy touts it as a great source of calcium, protein, and vitamin D. And it does have these and other nutrients. But it also supplies an abundance of artery-clogging saturated fat, as well as hormones and antibiotics that are linked to an increase in disease. Non-dairy milks have no reason to contain these. And when you choose organic, you avoid pesticides, too. Cow’s milk is often fortified with vitamin D, but so are many non-dairy milks. Some non-dairy are fortified with additional nutrients too, such as essential minerals or Omega-3 fatty acids. 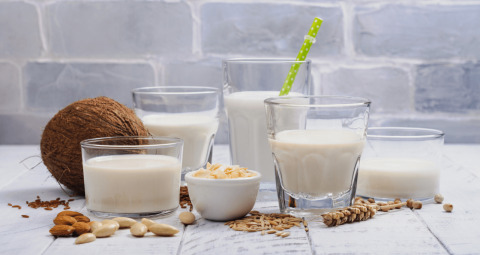 Soy and almond milk are often fortified to match the nutrient content found in cow’s milk, without the hormones, antibiotics, cruelty, and ecological damage. Around 65% of adults worldwide have some degree of lactose intolerance. You become lactose intolerant when your body stops making lactase, the enzyme you need to digest the milk sugar lactose. Is it possible that your body does this because you’re a grown-up, and you weren’t designed to be drinking milk anymore? Among the first options developed for lactose intolerant consumers was Lactaid, which has lactase added. Today, non-dairy milks are naturally lactose-free options for people who don’t want to try to trick their body into digesting a food it wasn’t designed to consume after infancy. It’s wonderful that we have so many milk substitutes. And non-dairy milk offers a lot of benefits! But there are a few problems to watch out for. Other than soy milk, many of the other plant-based milks have a common issue. To save money, manufacturers often skimp on the “base” product and use thickeners to keep the result from being overly watery. Then, they add “natural flavors,” synthetic vitamins, and sugar. When choosing milk substitutes, remember that not all products are created equal. Things like the nutrition profile, ingredients, environmental impact, added sugars, and best uses differ significantly between varieties, as you shall soon see. Soy milk offers one of the biggest protein bangs for your buck, coming in at seven to 12 grams per cup. Some brands use highly processed soy protein isolate to achieve this, while others use whole soybeans. I prefer less processed foods, so favor the brands made from whole organic beans. 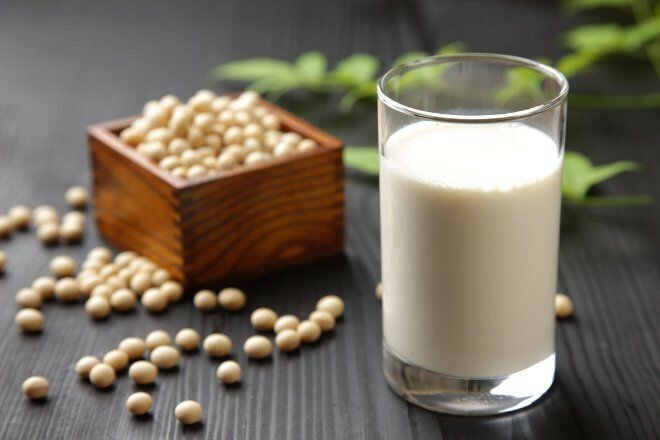 Soy milk is also often fortified with calcium and vitamin B12. Current research indicates that soy isoflavones lower cancer risk. How to use it? Soy is great for baking, cooking, or drinking plain. Note: If you want to avoid glyphosate contamination or GMOs foods, make sure to go organic with all soy products. 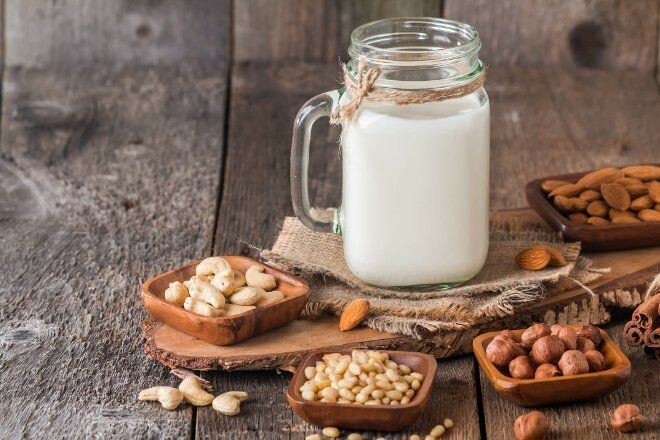 Almond milk has less than a gram of protein per cup, but it boasts 50% more calcium than a cup of cow milk. Almonds are rich in vitamin E, an antioxidant good for your brain, blood, and skin. Many commercial almond milks are pretty watery, only containing around 2% almonds, so I prefer making my own. And it’s great in smoothies! Some people have raised concerns about the amount of water it takes to grow almonds. And this is a real concern, especially because water-stressed California grows most of the world’s almonds. It takes about 920 gallons of water to make one gallon of almond milk. That’s more than other varieties of non-dairy milks — but still, it’s no more than it takes to produce cow milk. Cashew milk has unsaturated fats that are good for your heart, as well as anacardic acid, which may have anti-cancer effects. Cashews also contain lutein and zeaxanthin which benefit your eyes. Cashew milk is creamy and makes a great base for soups, sauces, and oatmeal. 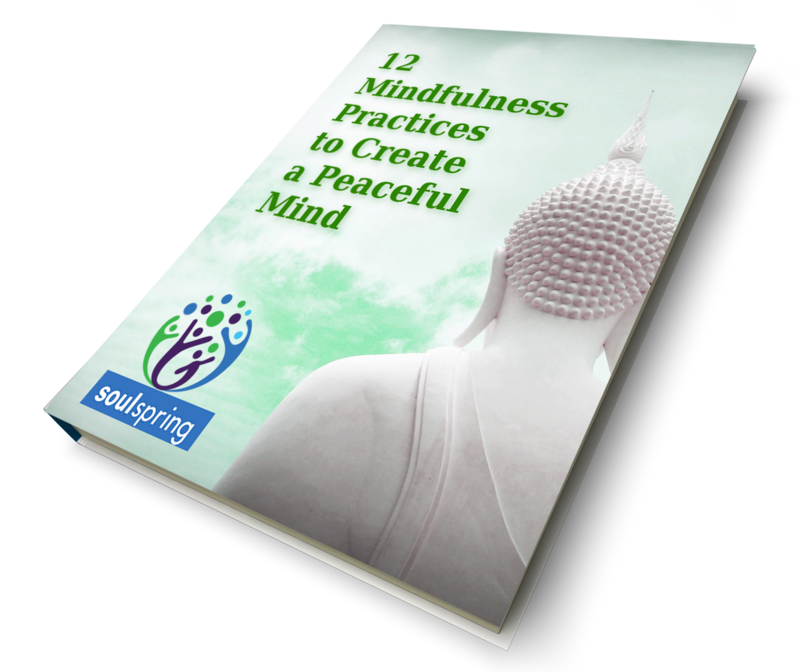 Cashews use fewer resources than almonds and are grown in areas that are less stressed for water. Coconut milk in a carton is a watered down beverage, different from the thick cream you find in cans for making many Asian dishes. 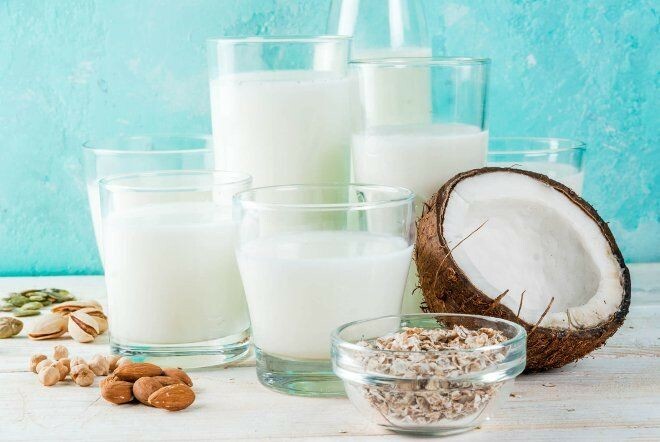 While coconut milk is rich in saturated fat, these are mostly medium chain triglycerides, which have mixed evidence when it comes to impacts on heart health. Coconut milk contains very little protein. As for the environmental impact, coconuts can sequester carbon in soil, which is a very good thing. They don’t require much water, but for many of us, they may have to be transported from far-away tropical places. Hemp milk has a buttery, nutty flavor. 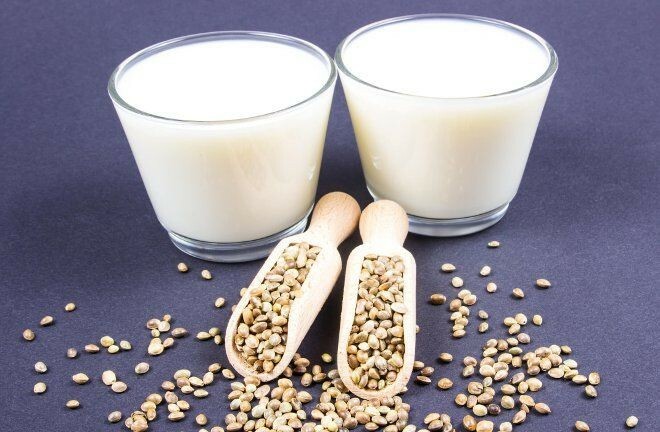 Hemp naturally contains calcium, so it doesn’t require the fortification that other milk substitutes might. However, many commercial varieties contain added thickeners and flavoring agents. Hemp is fast-growing, resistant to many diseases, and needs little water. Hemp milk doesn’t fare so well in coffee, but it can be used in cooking, baking, over cereal, or in smoothies. Quinoa offers more protein and fiber than most other grains, is naturally gluten-free, and contains all the essential amino acids. It’s also rich in iron, magnesium, and zinc. Milk made from quinoa has a distinct flavor and is a bit nutty — good for cereal and warm oatmeal. It doesn’t have a whole lot of quinoa in it, however, so the nutritional value it provides is limited, and it usually comes with thickeners, sweeteners, and flavors. It can be difficult to find low-sugar oat milk. Many brands use gums and oils to enhance texture. Oats are high in soluble fiber like beta-glucan, which benefits blood sugar, as well as digestive and heart health. Oat milk froths well and makes a nice latte, and it works well in both sweet and savory dishes. 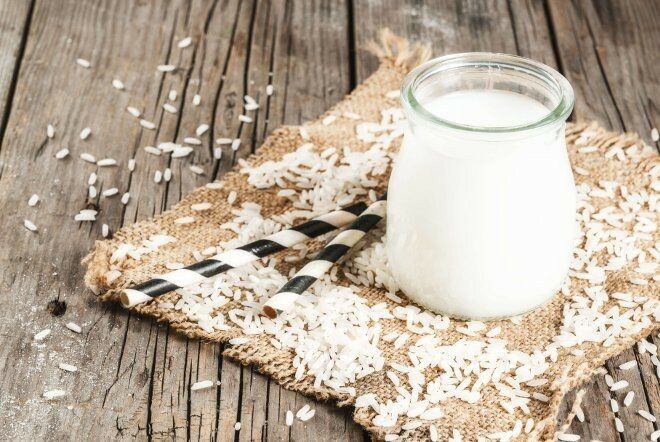 One of the original milk substitutes, rice milk is non-allergenic, but it doesn’t offer much in the way of nutrients. Some brands contain a lot of sugar, and rice has a high glycemic index. Rice is also at risk for containing arsenic. Rice milk is thin, so you may need thickeners if using in recipes. This one sounds strange, but don’t worry, the milk isn’t green like peas. Pea milk contains a comparable amount of protein to soy, though isolated pea protein is used to create a non-pea flavor. It has a slight aftertaste, and some pea milks have added oils. Pea milk has a third of the saturated fat and 50% more calcium than cow’s milk. It’s also more eco-friendly, as peas use little water or fertilizer compared to almonds, dairy, or soy. A new kid on the block, flax milk is made by mixing Omega-3-rich, cold-pressed flaxseed oil with water. It’s free from the top eight allergens for those who cannot consume lactose, soy, or nuts. The downside is that flax milk naturally contains no protein and has poor flavor (so it’s usually sold with a lot of natural flavors added). If you find a protein-rich variety, it’s because of the addition of pea protein. Flax milk can work well for cereal, baking, or adding to your coffee and tea. But it’s really just flax oil, water, and the addition of thickeners, flavorings, or proteins. I love flaxseeds, but the commercial flax milk offerings on the market so far have not impressed me. Cane Sugar — Many milk substitutes contain added sugar, and it’s often the second listed ingredient (ingredients are listed in the order of most to least amounts in a product). To avoid upwards of six grams of sugar per cup, choose unsweetened. Carrageenan — Carrageenan is derived from red seaweed and added to foods like yogurt, soymilk, and ice cream to thicken them and prevent separation. Some studies have linkedcarrageenan to inflammation, gut irritation, and even cancer. Some brands have started removing this ingredient per consumer request, but many still use it. GMOs — Most genetically engineered foods have been created by Monsanto (now Bayer) to withstand Roundup, a widely-used glyphosate-based herbicide they manufacture. Glyphosate is a probable human carcinogen. And it’s not just used on GMO crops, like soy. It’s also increasingly being used as a desiccant on non-organic oats, barley, and other cereals to dry the crop out before harvest. The good news is that foods grown organically are GMO and glyphosate-free. Note: Choose certified organic non-dairy milks to ensure that you’re not getting a dose of unwanted chemicals or GMOs. Instead of buying milk substitutes at the store, you can also make your own plant milk. It will contain far fewer ingredients than many store-bought varieties. And it will be free from additives, like oil and thickeners. How do you make non-dairy milk? The process involves soaking, draining, blending with water (and flavorings or sweeteners), and straining out the solids through a cheesecloth or nut milk bag. Homemade milks will stay fresh in the refrigerator for 3-4 days. You can use milk substitutes in place of anything you would make or eat using dairy. That includes creamer for coffee, buttermilk (by mixing with some lemon juice) in recipes, in cereal, and even to add creaminess to soups and sauces. Though very versatile, milk substitutes should never replace breastmilk (or infant formula). 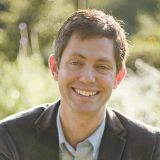 The consumer marketplace is changing fast, so much so that plants are replacing the fading dairy industry. The option to buy milk substitutes could save billions of animals, help save our planet, and greatly benefit your health. All you need to do is pay attention to a few details when choosing the right milk for your household — or make your own — and you’ve got a great alternative. Cruelty-free, earth-friendly, and nutritious milk made with the help of Mother Nature herself? I can’t think of a better way to replace dairy.